The one opponent that John Hathaway can't defeat is the very one that has kept him from becoming one of the UFC's elite welterweights. Hathaway's body has betrayed him as he has gotten to the highest level of mixed martial arts. He has Crohn's Disease and it has limited him to just three fights in the last three years. He'll make it four on Saturday when he faces Dong Hyun Kim on Saturday in the main event of a UFC Fight Pass card in Macau, China. 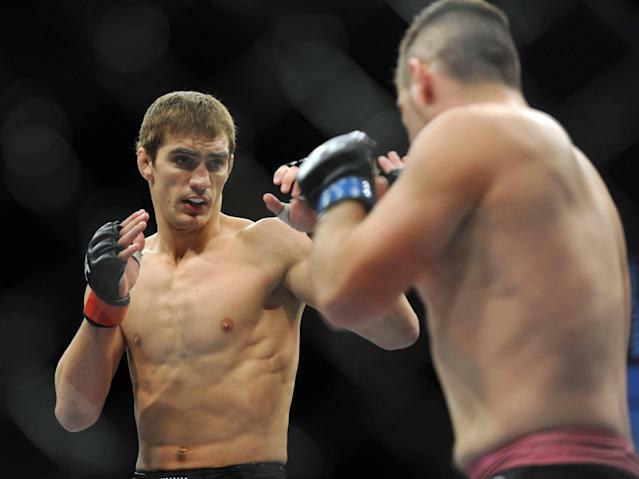 Hathaway, 26, will be looking to regain the momentum he had after he joined the UFC in 2009. He made a quick splash, routing local icon Tom Egan in Dublin, Ireland, in his promotional debut at UFC 93, then bested Rick Story, Paul Taylor and Diego Sanchez in his next three outings. A terrific all-around athlete who was once a promising rugby player, Hathaway seemed to be on the path to stardom when his body betrayed him. He's 17-1 overall in MMA and 7-1 in the UFC, but has been an infrequent participant over the last three years. Not long after a surprising loss to Mike Pyle at UFC 120, Hathaway began feeling lethargic frequently, got ill often, and would have flare-ups of intense abdominal pain. After defeating Kris McCray in Seattle on March 26, 2011, Hathaway didn't fight again for nearly 14 months after having been diagnosed with Crohn's. People react differently to Crohn's, but common symptoms are persistent diarrhea, rectal bleeding, abdominal cramps, fever, weight loss, loss of appetite and general malaise. None of them are helpful for a fighter in an intense sport such as mixed martial arts. There is no cure, though it can be managed and after several fits and starts, Hathaway said he feels energized and ready to regain his momentum. "I haven't been around because of everything and it's set me back a bit," Hathaway said. "But if I beat Kim, that will bring me back to where I think I need to be." Kim is 18-2-1, with only one real loss. He was injured just seconds into a bout at UFC 148 with Demian Maia. His only true defeat was a knockout at the hands of Carlos Condit on July 2, 2011, in Las Vegas. A win over Kim would be significant and put him in position to move into the top 15 in the UFC's welterweight division. Hathaway is not currently ranked in the top 15, but that's largely a function of his inactivity. He hasn't fought since defeating John Maguire to raise his record to 17-1 on Sept. 29, 2012. It's been a long and frustrating journey, but he's found how to live successfully with his disease. Beating Kim, who is ranked No. 11 in the division, would be a reminder to poll voters of his solid record and quality victories. He's had to change his diet in order to get back to fighting shape. He's removed processed foods entirely from his diet, and is eating more bland food, and has taken to juicing. It's enabled him to manage the symptoms and allowed him to return to competition. He wasn't given an easy return, but he said it's the kind of challenge he wanted. And he believes he's healthy enough and prepared enough that he can pull out the win and regain his momentum. He's 6-foot-2 with a 75-inch reach and has the long, lean angular body type that can create problems for many top 170-pounders. Kim is definitely one of those, and Hathaway admits it's going to be a tall order. "I need a good work rate and to stay away from his clinches and not allow him to get on top," Hathaway said of Kim. "He drowns you when he's on top. I either have to be on top or I have to keep my distance and use my left-right and wear him down. That's what I think will get me my victory." He believes it's realistic that he'll be able to fight three times in 2014, matching his total from 2011 through 2013. He hasn't fought three times in one calendar year since 2009. Being ill is never good, and particularly not for a professional athlete who is entering his prime years. Life always presents problems, however, and Hathaway is dealing with them as best he can. "I just couldn't do what I wanted to be able to do," Hathaway said. "But I'm feeling good and I'm optimistic I've got a handle on this and I can get back to fighting regularly." If he can, the crowded welterweight division will add another elite fighter near the top.